It looks completely delicious doesn’t it? This really is a perfect flaky pastry and ricotta slice. Well it actually is as good as it looks. Each time I’ve made it has been better than the first. It’s a two-part recipe that takes a little bit of time. I can’t always make things that are quick , sometimes things need to take a little time because …good things do take time just like the old saying goes!. 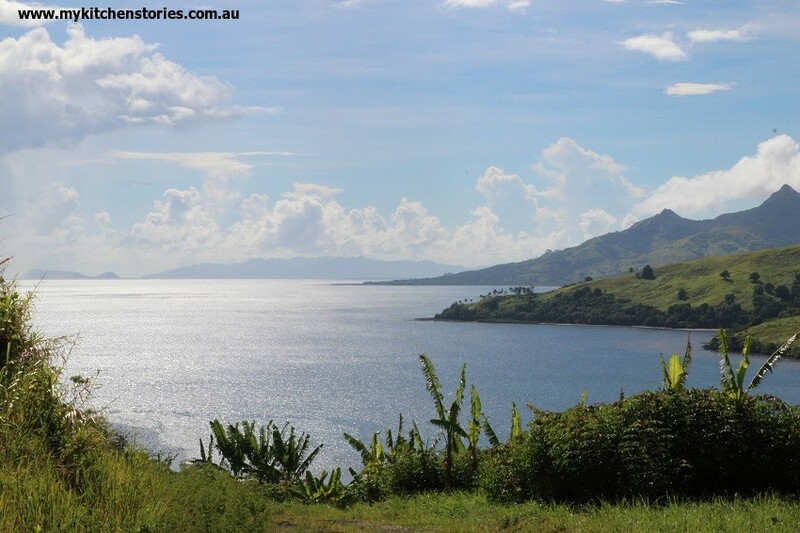 When I was in Fiji this year, I was surprised at the untouched beauty. Although I know that Fiji is pretty much Australia’s local holiday island I hadn’t really imagined how beautiful it was. There are remote untouched mountains and people still living a life with nature. Everyone is friendly and you find yourself waving and saying Bulla ( the local greeting morning, noon and night) to everyone you meet. Time seems to stand still, it doesn’t matter, it takes a lot of minutes to make a lot of smiles to fill it. Fiji time is legendary. The heat is also legendary and I may not have survived the heat had I not had access to unlimited supplies of water. I wouldn’t dream of drinking water from the tap when I travel and I didn’t in Fiji either. I discovered that I really liked Fiji water, not the Fiji water from the tap but the real remote mountain water that is bottled in Fiji. Rain water trickles down through the layers of volcanic rock in the mountains that dominate the landscape . It is almost exclusively available all over Fiji and although I had seen it before I didn’t realize it is a real mineral water that actually takes hundreds of years to make. It’s bottled straight from the source bringing with it the minerals and electrolytes that make it so refreshing. Fijians are justifiably proud of this smooth tasting naturally made water that has probably been filtering in this land of smiles since the beginning of time. 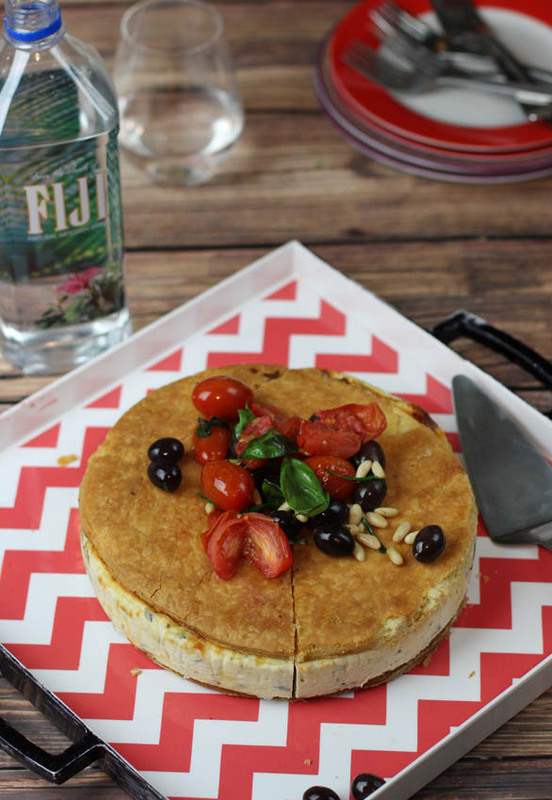 I know it sounds just a little bit corny but I think my Perfect Flaky Pastry and Ricotta Tart and the Fiji water are a the best match because Perfction Takes Time. Perfect Flaky Pastry and Ricotta "Slice"
Put the flour and salt into a food processor and whizz then add the chilled butter. Pulse till the butter and flour are just starting combine but there are still lumps of butter. Some of the lumps will be quite big and the others small. Pour onto a bench and make a well in the middle. Add about 1/2 of the water and working quickly start to push the flour and butter together. If the mixture looks like it will be too dry and crumbly add just a bit more liquid. Too much liquid will make a sticky tough dough. LESS is better. Push the pastry together in a rectangular shape (for later easy rolling) and wrap in plastic and freeze for 15-20 minutes. You will need to roll and fold the pastry three full times. Therefore follow this next step three times. Roll out the pastry and cut two circles by sprinkling a little flour on the bench and starting to roll. Try not to stretch the pastry. Roll it . It's best to not roll too thinly it needs to be at least 1mm (1/3 in) thick. The first will be easy to cut as you will have plenty of pastry. Make sure that you cut as close to the edge of the pastry as you can to cut out your circle. Use a paring knife and the cake tin as a guide. The second you will need to fold the pastry over itself so the layers stay intact. Never roll into a ball. Sprinkle the bench again and roll out the pastry, making sure that it is rolled not stretched. Now you have two circles the same size. Put onto a flat plate or cake base and refrigerate for 10 minutes. Bake each circle separately. Line a baking sheet with paper then the circle of pastry and then another piece of baking paper. Place the other tray over the top. This weighs down the pastry making a crunchy fully cooked disk. It will be flaky and easy to cut when you have finished your "slice". Bake for 20-30 minutes each over is different. My oven is very cool, but I still always check the circle after the first 20 minutes. It should be a golden colour. Do not take it out of the oven before it is this colour. When ready put onto a cake cooler to cool down. Repeat this step. The discs can be made ahead. Once cool put them in a airtight container for up to 3 days. Put the ricotta into a bowl with the chopped herbs, cheeses, olive oil, salt and pepper and egg. The mixture will not be very loose. Spread into the springform tin and push down with the back of a spoon. .
Bake for approximately 20-30 minutes. The ricotta does not need to brown or colour at all, it just needs to get hot enough to set the eggs. Push in the centre with your fingers at 20 minutes and if it feels quite hot and relatively firm to touch, then take it out. Let it sit till just warm. Run a knife around the inside of the cake tin in case the ricotta is stuck to the tin, then loosen the side and remove. Put the disc of cooked flaky pastry onto the bench and trim around the edge using the cake tin as a guide. Put one of those trimmed discs on top of the ricotta and flip over inverting the ricotta on to the top of the pastry. Now you have a disc of flaky pastry under your ricotta. Put the other disc on top. To get THIS and many other Perfection Takes Time Recipes go to fijiwater.com FIJI Water’s homepage. 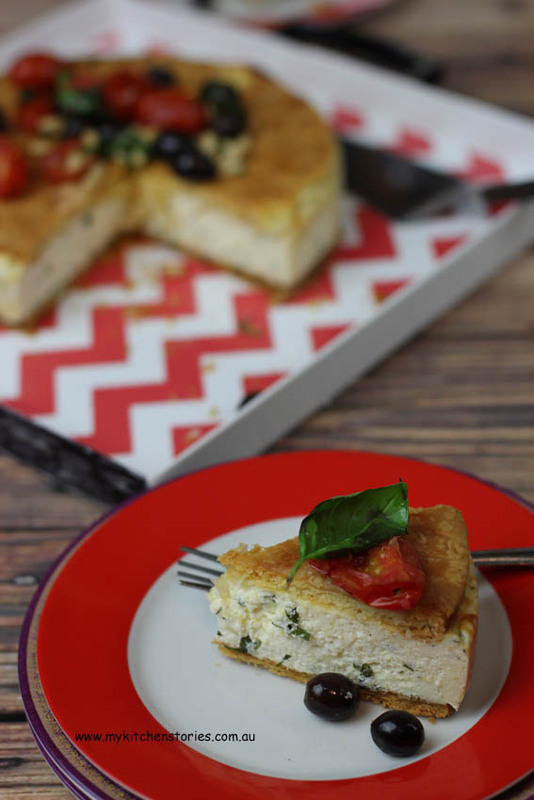 Tania, your ricotta slice sounds delicious… and the Fijian holiday, well that’s just heaven on earth! It has been many years since I was in Fiji, and aside from the beauty, I won’t forget the heat. 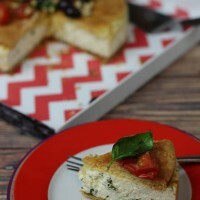 Your ricotta slice looks great! Oh that slice really does look perfect. And I really must give flaky pastry a go one of these days. I LOVE that video. Why don’t you talk in it?? 🙂 You could do a great voice over. I’ve never had baked ricotta, can you believe it? Nuts!! I enjoyed the video! Your baked ricotta looks fantastic. Very cute video Tania! Have I missed things or is that your first one? No not my first video Lorraine but still a beginner! It does look completely delicious! 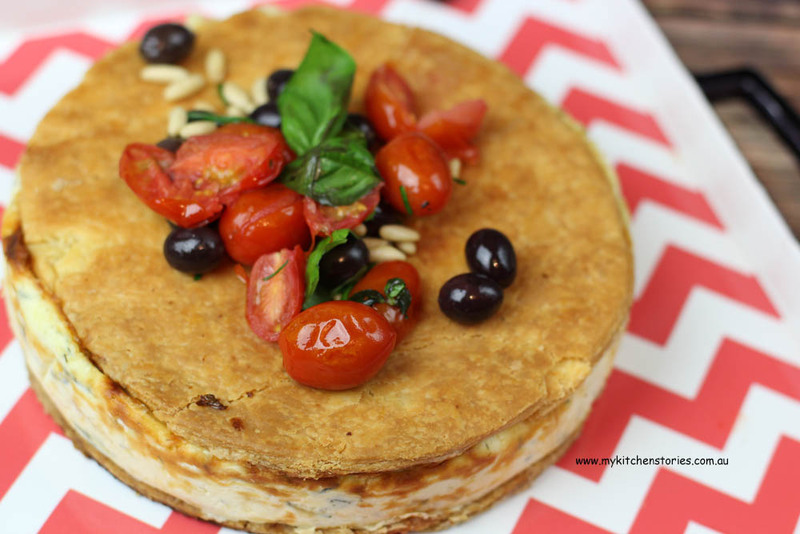 I love baked ricotta, and this is absolutely beautiful!